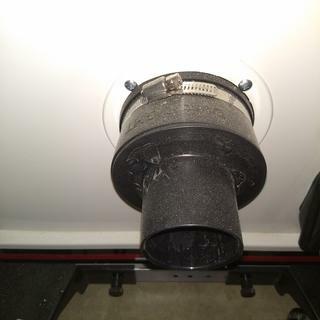 Allows you to use your shop vacuum for dust collection on power tools with 4'' dust ports. Goes on great at delta bandsaw. Swivel is nice. I had purchased a band saw from Grizzly. However, Grizzly did not offer a dust port adapter to fit the metal port on the tool. You folks had the closet adapter. It require grinding out some of the material on the interior 21/4" port. With a Dremel tool and a round file I was able to complete the secure needed assembly. You guys are just the best and over the years I have always been happy with my purchases from you. Keep up the good work. This adapter is THE answer to using a shop vac with a 4" port on wood working machines !! There are lots of "adapters" out there...and I've tried a few...but this one is the one that works best by far !! No adapter to adapt the adapter needed (LOL). 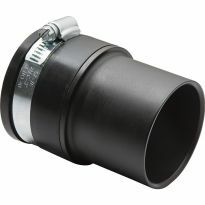 The 4" end fits typical 4" dust ports (with clamp) and the small end fits 2 1/4" AND 2 1/2 shop vac hoses. 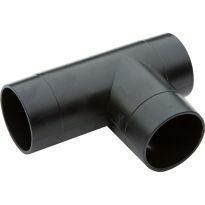 The 2 1/4" hoses go INSIDE the adapter and 2 1/2" hoses go OUTSIDE the adapter. Works GREAT !! 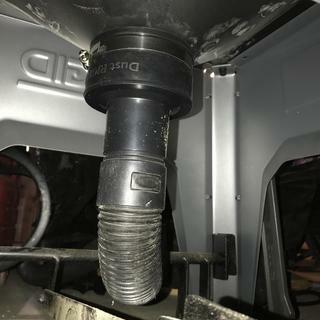 Just bear in mind that you will not have the level of a typical 4" dust collector system, as you are limited by quality & strength of your shop vac. On my table 6" belt sander, I am picking up about 70% of the dust and that Powermatic belt/disc sander is a dust factory !! On my band saw I now pick up about 50% of the dust. Still need to try this on table saw and planer. Glad to have found this particular adapter !! Bought to connect my shop vac to the dust collection port on an older Delta planer. Works as expected! Great fit for going from my bandsaw to my rigid shop vac. Bought this to use on the blower on my planer. Fits snuggly and works well. because the 4" end is rubber it allows for some minor variations in size. Worked perfect for me. easy install. Works great hooking 4" dust gate to a standard vacuum hose. Works perfectly to connect my shop vac to my table saw! This item fits perfectly over a 4 inch fixture. Works great with the shop vac. I needed something to connect my shop vac to a couple of machines with 4" dust ports until I get my dust collection system installed. This worked perfectly. worked well with the dust collecter. Work well on a sawstop To hook my shop vac up to and left a little saw dust behind. This adapter, with the furnished hose clamp and the flexible rubber on the adapter, attached well to both my bandsaw and planer and then to a standard 2-1/4" vacuum hose. After I purchased the first adapter and it worked so well, I purchased the second adapter. The price was a little high for an adapter, but the quality was very good and the hose clamp was furnished. I purchased two and installed them on a thickness planner and a jointer. They were very easy to install and worked exactly as intended. This worked perfectly to adapt the outlet of my Unisaw to a Rigid Shop Vac. Just what I needed to connect shop vac to my new band saw. Finally a reasonably price adapter that actually works. No more (ok, a lot less) sawdust blowing around the garage. 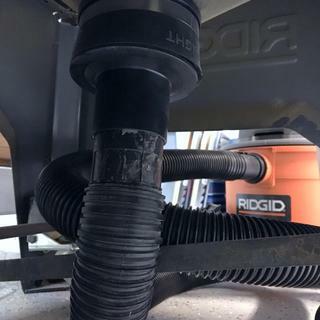 I have a Laguna 14BX bandsaw and I needed a way to connect a shopvac sized hose connected to a Dust Deputy for a quick cut. Fits great and the ring can be tensioned to either remain in-place or to be just tight enough to slip on and stay on. Works like a charm. Fits the Ridgid 4512 Table saw perfectly. I like that the rubber is semi-flexible rather than a hard plastic like some of the other adapters out there. Added this to my "Big Gulp" dust collector on my midi lathe for use with my shop vac. I had trouble finding the right adapter to fit my vacuum ports on my Powermatic shaper, jointer and planer. The Dust Right 4" to 2 1/4" work great with my Sears Shop Vac. Excellent fit for the Dewalt 735 planer. This one fit my saw port just as advertised. Good buy. I purchased two other adapters from other stores, both said they would fit a 4” port. They were the same OD as my saw port so they didn’t fit. The adapter from Rockler was just right. No frills, no gimmicks it goes on and it fits well. I tried to see if I could buy PVC parts to create this item. Since I had no luck finding what I needed I purchased this for my Delta Planer and it was an excellent fit. Should have bought this awhile ago. The shop vacuum tool port adapter works great. The added pipe clamp is perfect for permanently attaching it to my new Jet table saw. I can quickly remove my shop vacuum as needed. This item save me tons of money from not have to purchase a dust collection system. Solid built. It fits my Saw-Stop just right to go to the dust collection hose to the dust Right. No trouble setting up. Great & simple. High quality material, does what it's supposed to do. A bit pricey for what it is and does. But it was an item that I could put in place and not have to mess with or worry about. That's worth a little more $ to me. 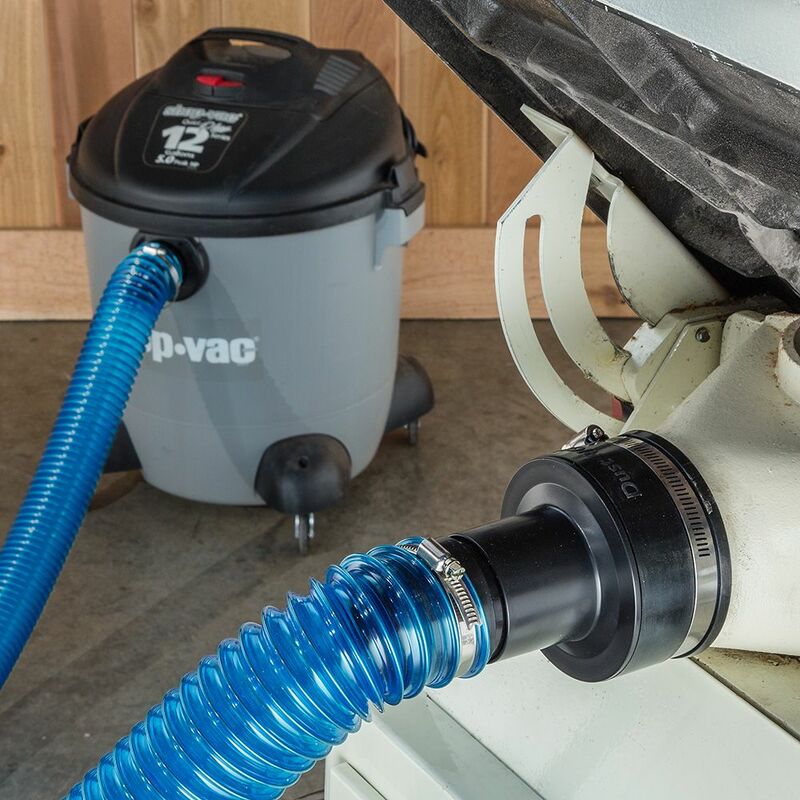 Multiple uses on several machines to standard shop vac. Works great with my table saw and shop vac . I Highly recommend this product. Attached perfectly to my saw. Worked perfectly to connect my SawStop to a dust collection using Craftsman vacuum tubing. Had frustratingly tried a couple plastic connectors previously. Good fit. Does what you want it to do. 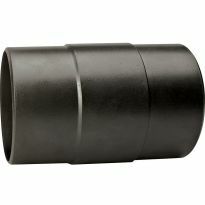 Fits perfect to our grinder and exhaust system. Love it. Works great on a Rigid R4512 table saw to transition to a shop vac. This adapter solved a problem I've had for a very long time. It fit my Jet table saw and vacuum perfectly. This attachment works well to connect my shop vac to my JET table saw. To mount to my band saw. need an adapter for my Ridgid table saw. Best adapter I've used. I have several. I will need this to attach to the table saw hood I just ordered. Simple, concise means to connect my planer to my shop vacuum. For shop vac connection to my band saw. I chose this port to make using my shopvac on multiple tools. It was the only product I could find that suited my needs, and the customer reviews were all favorable. Your price was as low as anyone. I want to connect my DeWalt planer to my Rigid Shop Vac. Hopefully this will work. To adapt the hood to my shop vac. Like the 2-1/2" very much. Let's see how these work on my bigger ports. To collect dust from my table saw and connect it to my shop vac. I needed adapters for a couple different machines ,so that I did't have keep changing when I switch from one machine to another. Band saw tool port to shop vac. It fit my Router Table. Meets my needs for size and function. 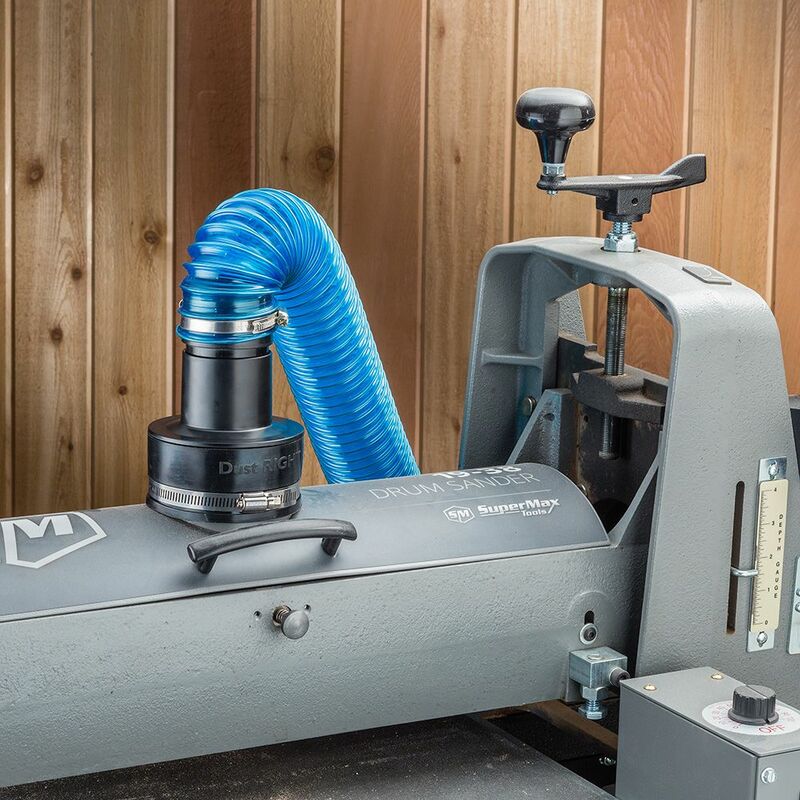 Neat, concise adapting shop vacuum hose to bandsaw. I have one and it works and fits great. Best fit for my needs. Need for my Delta Planer to hook to the separator and shop vac. These seemed to be the only adapter that would work with my Jet router table 4" port. Will use it with the 48212 hose kit to connect to my Ridgid shop vacuum. Needed for shop equipment setup. Could not find another that will fit. Perfect piece for what I need. 4" dustport on a new bandsaw ... hard to connect to a 2 1/4 Shop-Vac ... this looks like it will do the trick and allow easy connection / disconnection of the Shop-Vac for use in other applications. What is the OD and ID of both ends of this adapter? 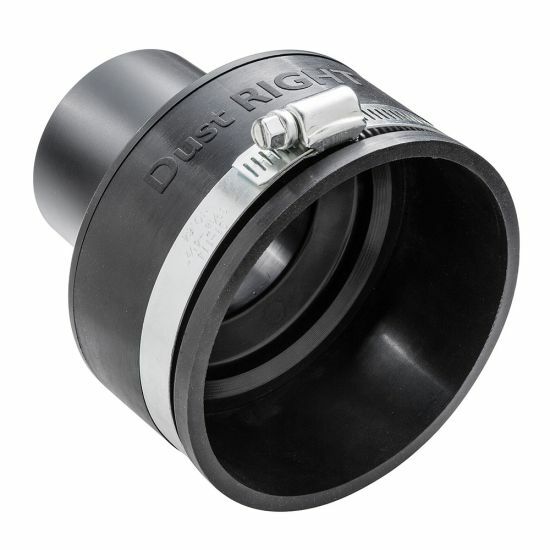 Will this adapter fit directly onto the dust right dust collector and then allow it to be used with a 2- 1/2" hose and handle? What is the I. D. of the four inch end? BEST ANSWER: The inside dimension is 3 13/8's almost 4". The outside is 4 3/16" so anything you want to slide over the 4" end has to be 4 5/16". The inside diameter on the large side is 4 inches the inside diameter on the small side it's 2 1/4Enter an answer to this question. BEST ANSWER: I don't think so. I use both products and use a 2 1/4 to (around 1" or so, I forget) adapter to connect them. 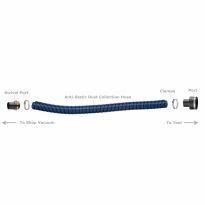 In other words, I think you need another adapter to step up in size from the small hose kit to a standard 2 1/4 size or to connect the hose in the small hose kit directly to a 2 1/4 port, forgoing one end that comes in the small hose kit. 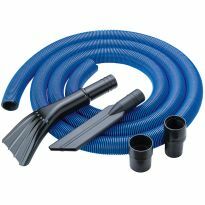 The small hose kit seems designed to connect a small tool like a detail sander to the around 1" port on a shop vac. It is very handy in that capacity, however, fitting virtually any small tool because the supplied ends are quite flexible. It looks like it should, but to be perfectly honest I have only been able to make TWO connections using this kit. The hose is so heavy and I've only been able to use two connectors so far. Personally, I don't think it's a good buy!!! Sorry, Rockler. Will the 4" end fit over the 4" opening on item # 88460? Does this have a 2-1/2" OD? 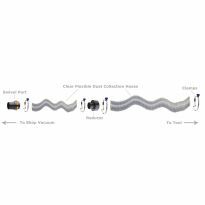 I want to clamp my 2-1/2" ID dust collection hose directly to it. Thanks.